Special thank-you to Wayne Fiske (Left) who found and rescued the sign in Buxton, (28.02.15). Hardy (Right). 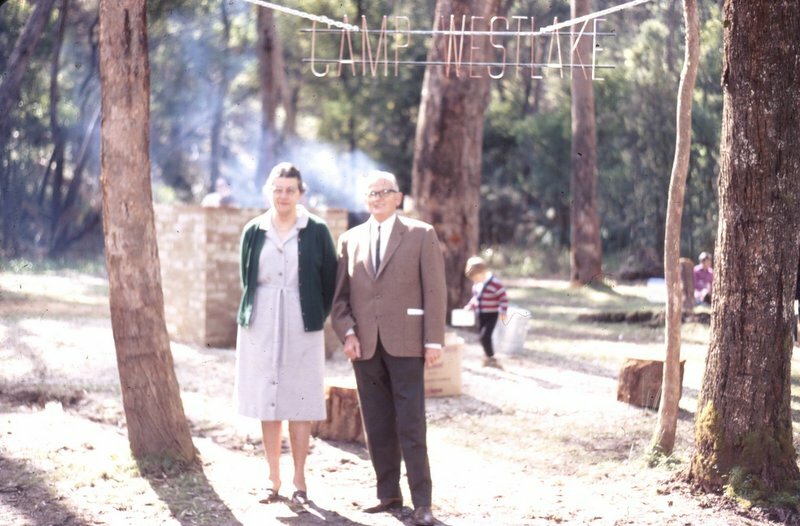 I suspect this sign may be the original 'Camp Westlake' sign that hung between the two trees as there are three layers of paint on the letters; originally gold, then green, then yellow. There are also remnants of brown paint on the top edges of the sign. There are also two drilled holes next to the 'C' and the 'E' from where it would have been hooked and suspended from the trees as there are no other fixing holes in the front. What I know for sure is that this sign was at some point mounted on the right-hand side of the rebuilt main building. I remember it still being there when I visited the Camp in 2006. I suspect it may have been discarded into the nearby bushland when the main buildings were demolished in early 2014. Through contacts in Buxton, I first heard a rumour that someone had seen the sign in early 2014 lying in the bushland. The sign in 2006 attached on the main building. There is a distinct saw mark in the bottom right hand corner. Today, the 28th February 2015, Wayne and his wife arrived at my house with the sign! Thanks again to them both and it will now have a good home as the last surviving piece of the Camp. (LEFT) The sign in late 1960s, sometime after the Westlake Opening in 1968 as there was a different sign at the opening (RIGHT). Both signs were hung between the same trees.